In 1953, John Steinbeck wrote, “Positano is dream place that isn’t quite real when you are there and becomes beckoningly real after you have gone.” Positano is my word for having my family home for the holiday. It was amazing after so long (maybe two years) to have everyone from the grandkids to son-in-laws all together at once. This is what Amber wrote as they headed south for their visit (this is not about me helping them to get home but about how badly we all needed the love of our family so much). Amber Wisniewski traveling to Houston, Texas from Denver International Airport. We were blessed with a Thanksgiving visit that started on the Saturday before Thanksgiving. We had a lively schedule and yet plenty of time to visit, play games and re-connect. Ryan and Amber also got a chance to get to the Equestrian Center and watch Lauren compete. Lauren has had several good months as she has learned the ins-and-outs of new mount KY but it was at this show where things really started to come together. As the Denver family was only getting home one time, we had to combine Christmas and Thanksgiving (in that order) to spend it in person. Our schedule included Christmas on Monday and Thanksgiving on Tuesday. A little odd but no one seemed to mind (especially the kids). I also was determined to re-enact the Holiday photo from two years ago (our last time all together) into a new photo for this year. Previously, I had my steadfast mare Kalani who was great at standing still but this year the photo was going to be on my mare Nova while quiet-standing still is not her best thing. Although you could not tell by this picture Nova is a bigger mare. I was just glad no one fell off. Nova started to move around. Jordyn and Kendyll wanted off now!! They have gotten pretty wise. Lexi and Riley were like, no problem Granny, take some more pictures! Moving on to Christmas Monday (Nov.21st), I felt the usual excitement around the kids and presents but there seemed to be more. As everyone rushed to open presents (I felt like no one was giving fair attention to what was being opened) a huge box suddenly appeared in front of me. Clearly, this was about me and everyone was carefully watching my reaction. I hate surprises. At least most surprises. I was scared opening this box. I am not often caught off-guard but I had NO idea what was going on. I thought something was going to jump out at me-like a llama. But as I tentatively opened the box I saw a huge suitcase not an animal. That surprised me even more. I did not need a big suitcase. I had not left the farm except for small suitcase adventures in years. Then I had to open the suitcase. That was scary too! I saw this cleverly crafted sign inside. 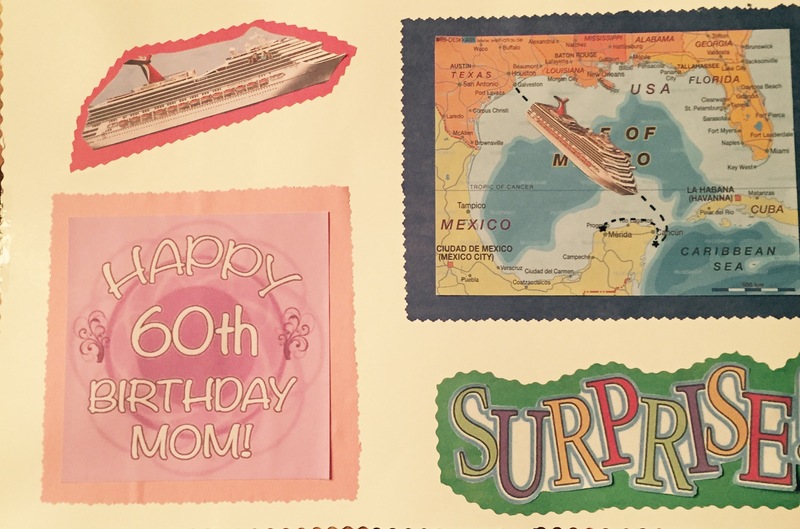 Yes, the girls had been planning for some time (and I had no hint) to take me on a Mother-Daughters’ Cruise for my 60th birthday in February. Oh my goodness. I was shocked and SO pleased. I know all three girls have struggled with finances these last years and to see they had done this for me was amazing. They had even cleared it with my boss and set up coverage for the animals. I am going on a CRUISE with my daughters!! WOW!! What a birthday, Christmas, Thanksgiving surprise. What wonderful girls! It was a wonderful time and here are some of the best pictures. Enjoy. Texas Thanksgiving in the pool. I hope all of you had a wonderful holiday whatever one you were celebrating. Mine was totally unreal! Oh, and I might have adopted two cats. I know, I know. But I am running out of time. If I am going to be 60 and these are teenagers, then they might well out live me. I had to help them when I saw their faces. I intended to get the girl but the boy was wearing a bowtie so what was I to do? They are settling in well and are totally beautiful.